Pros: It gives an answer to most of the administrative and other kind of needs of our Cultural No Profit Association. The founders of Raklet have been and are open to our requests and we found a very positive collaborative dialogue with them. Overall: I am the President of a No Profit Italian Cultural Association (we perform Ancient Classical Theatre in Milano) and I can assure that a software like Raklet can give a very important help in the administration of the Association (a complex task) and in the relationships with members. Recommendations to other buyers: GO ON and let us to have also a complete Italian version, if possible! In Italy (but not only here) it might find a good market! Pros: Setup your membership plans, collect new ones online and the system will take care of renewals and follow ups for you. You can use their newsletter functionality to send newsletters. Another great feature is their event management check-in. We can sell tickets online and at the door. We can easily check-in guests and follow up after the event accordingly. Overall: It makes our life really easy. Thanks so much for your feedback! We're always here to help and make Raklet even more efficient for our organizations. Pros: It is really modern and easy to use. 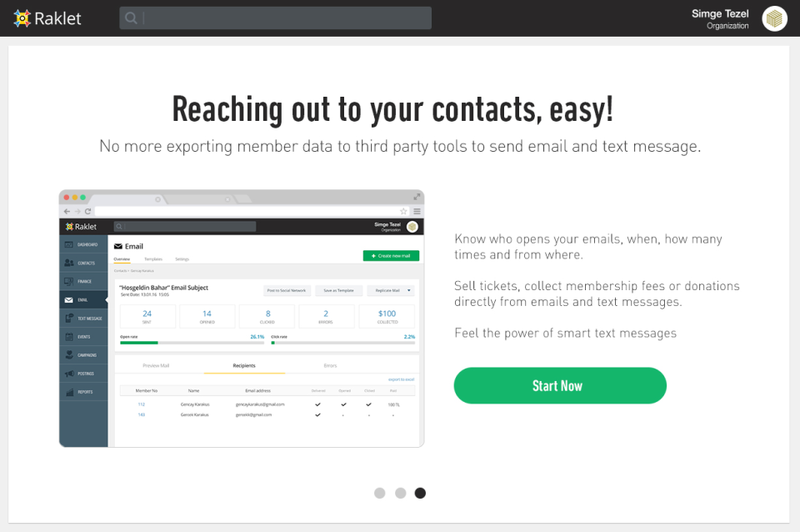 All the apps are connected so you can use CRM, Email Marketing, Mobile Apps, Membership Management all in one place. Support team is really helpful as well. Cons: Nothing in particular. Custom development is affordable as well. Any feature we need is built by Raklet team. Pros: one of the best thing about raklet is that they keep updating their application continuously. Overall: very simple and useful application which help us to manage communication between the members of our association, also which let us to keep updated our member database. Thanks so much Can! We love working with you as well! Cons: The personalization feature could be more. Overall: Thanks to this very practical software, we do not need to develop any external solutions. Pros: Raklet is a point solution for our donation system. It is designed for effective collaboration and social networking and managing our complex deals with members and donors. It is also useful and nice tools for small to midsized civil societies and NGOs. Cons: Some menus and forms are a little bit confusing. Workflow and knowlgedge management are not flexible enough. Pros: -Easy for administer, you do not need to be a IT guru. 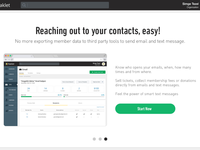 -Importing members is strait forward, easy and effective. -Their economic model for pricing, lets you begin, consolidate your non profit org, and the pay later if you growth. -Ready to use auto member management. Overall: Raklet has it all, all the features, functions is easy to begin with. After evaluated 10+ solutions, including the open source ones, no one fills up our necessity. Recommendations to other buyers: Give it a try, you wont regret. Thanks so much for your great feedback Rafael. We're always here to help! As we were about to spend thousands to develop membership software, we discovered Raklet and saved. 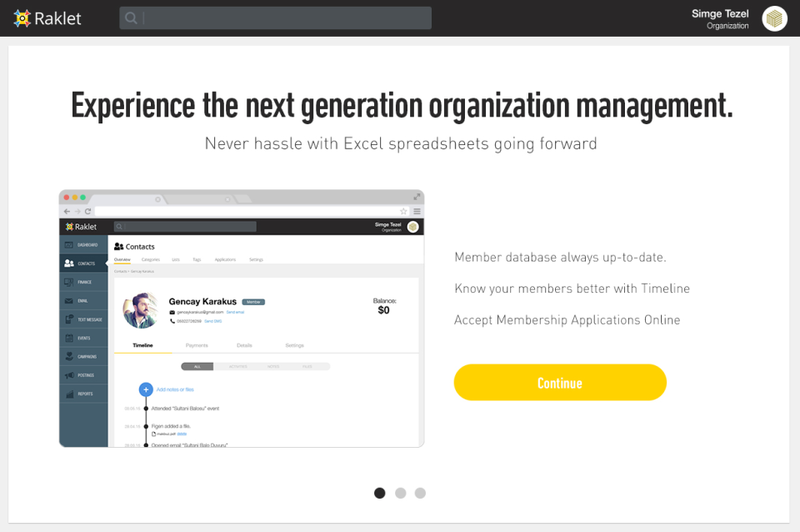 Pros: Raklet has a lean and well thought architecture that provides you the most important features you need for membership features. It looks familiar from day 1 and is easily usable by staff without extensive training. Cons: Well, we are currently working on a feature to customize Raklet to insert a specific type of membership information. If we fail on that, its customizability would be the least liked feature but currently that is not the case. Overall: As a non-profit, we've been working with Raklet for around 2 months now. Customer service is over the top! They've been listening to all our needs and accommodating, very quickly. System is very easy to use; quite user-friendly. They also constantly keep improving it. We look forward to continuing to work with them. Everyday we wake up and start working on Raklet to help communities such as Haydos who are making a huge impact for the world. Thanks so much for your support. This is what we were looking for our organisation for gathering people! Pros: Raklet is a SaaS and you can rule it where ever you want. Cons: Its still on the way and needs more developing. And they should consider about the feedbacks. They do though. Overall: As a non-profit organisation we were trying to gather people on online system but the applications which we tried before always missing about the functionality like collecting money, arranging an organisation on web etc. With the raklet you can arrange everything on one software. Membership, dues, mass message etc. Recommendations to other buyers: Mobile application is must-have! Thanks so much for your honest feedback. We're always working hard to make Raklet world's leading online community management and payments platform. We always add our users' feature requests to our roadmap but sometimes it takes awhile. Please let us know through chat on our platform as we love hearing feedback from our customers. Thanks! Cons: Still need to maintain separate website...an integrated system would be nice. Overall: Trying so meet client needs and expectations to be able to pay by CC, Cheque or cash when it is convenient for them without too much backend bureaucracy ...ie we all volunteers and want to minimise workload. Thanks so much for the feedback Bill! We're currently working on our mobile apps and website builder. For now, we build websites and apps for our clients per request. It will be all automated pretty soon. We'll keep you posted. Pros: I love this alumni management system. It is very easy to use. It gives the opportunity to communicate with alumni in a more sophisticated way by creating categories in database. 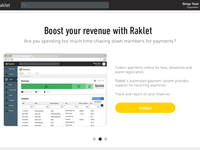 Cons: We'd like to store all of our accounting in the software but Raklet focuses more on revenue generation and growing community. Recommendations to other buyers: Unlimited contacts is a must for every organization and Raklet is the only one providing it for free. The system has too much impact on revenue increase..
Pros: SMS and mailing processes have a very easy workflow. The results can monitor very effectively and you can extract the reports. Cons: Some forms and automation functions are not user-friendly. And the special fields that you are defined during upload cannot link to the forms or new user application screen. It allows you to manage all interactions with your society members. Pros: -You can use tags to classify the members. It allows you call them back when you need. -Organazing events and charging for the events much more easier. Cons: Social network can be improved with more function. It is just allowed you to message the other members. Pros: I like that I can finally keep all my members organised. I also have the ability to send newsletters from the software RAKLET. Cons: I would like to see that receipts are sent out to members automatically when they pay such as an invoice upon payment. Overall: My overall experience with Raklet has been brilliant. I have been able to chat with Raklet not only via live chat but also on the phone if I have any questions. 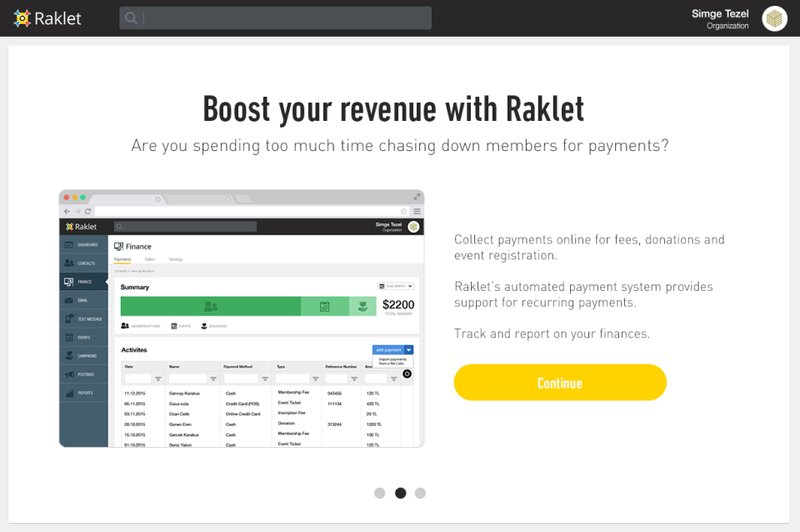 I would definitely recommend Raklet to anyone looking for membership software. Raklet also customised the software to suit my needs via their technical team. I give Raklet 5 out of 5. Comments: While deciding among different membership management systems, I think one of the most important things to consider is how much they are easy to use. Raklet has a very user friendly interface and there is no need to have specific knowledge. 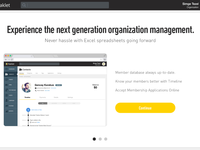 Also Raklet is very helpful for organize your network in your association. Thanks so much Furkan for your kind words. We're always trying to simplify our product while empowering organizations with more automation and power features. Comments: Before Raklet, the management of our database was taking all our time and energy that we had to delay many projects due to the lack of human resource. But Raklet, as a well designed nonprofit software has solved this problem via giving the opportunity to manage all the processes in the same online platform. Now, we can invest our time to develop our projects. Thank you! Thanks Cem! It's a pleasure for us to support amazing organizations like yours. Great application for generating revenue for the association! Comments: We've started using this software for our alumni association and we've increased our revenues significantly. We can send an email to our members with an embedded payment link which they can click and pay easily without login. We love the social network aspect as well. Our members can now message to each other privately on this platform. Definitely recommended. Comments: Managing a community efficiently and trying to make this in a durable manner require a healthy communication strategy. Thanks to Raklet, you can communicate with your connections via their most updated contact informations and you can see the results of your strategies. Thank you Can! We're always here to help! Comments: The website is an important role in making the easier life for people. We quickly go to our works and the communication is so easy with our member. I definitely advise you to use the system. Thanks! We love supporting engineering communities. Comments: A system that facilitates the use of our members. They can easily update their information and pay dues. A system where we can send e-mails and sms with ease. I am convinced that each and every day will grow even more.